There you have it! All my Christmas decorations--yes, all of them!--in two paper boxes. It feels so good to know everything fits in such a small space! Two boxes keep me from acquiring more than we need. Two boxes keep me from a house large enough to store items used once a year. Two boxes keep me free from packing and storing and moving too much. Two boxes keep the holiday simple--and the mother, sane! I have something similar which I love. It feels good to be getting back to normal. I'm all about organizing and decluttering come January 1. Cute storage boxes - I have plastic containers. I like your thoughts that 2 boxes are more than enough for Christmas decorations - You are so right. uh, my ORNAMENTS wouldn't even fit in those boxes. . . . . we have STUFF. . . .
Great boxes! 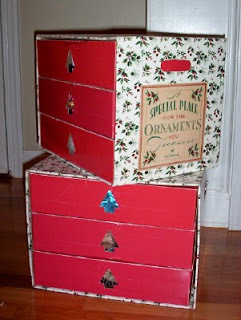 I have all of my tree ornaments in two cardboard chests that stored sewing supplies for many years previous. Our collection is quite large though still frugal as nearly all were gifts saved from childhood forward...we exchanged them with extended family in lieu of more costly presents. I know you're still really just moving in. But I am highly interested in your system for storage, rotation of items, managing records... i'm sure you have wisdom to share. I am ashamed to mention how many boxes of Christmas decorations I have (so I won't)! I'm very impressed with your storage solution! She just took a large, cardboard box and glued plastic (or paper) cups on the bottom. (neatly, in rows). Every ball was put in a different cup. Then she took a large sheet of cardboard (as big as the box) and glued more cups on it for a second layer.